2015/16 will be marked as years for celebration for those who left Clarendon School in 1962 as 70th birthdays are reached and families organise surprise parties for the unsuspecting. It was such an occasion that prompted ex Clarendonian Pete French’s partner Val Osborne to contact old school friends last February with a warm invite to Pete’s 70th on the 19th March. 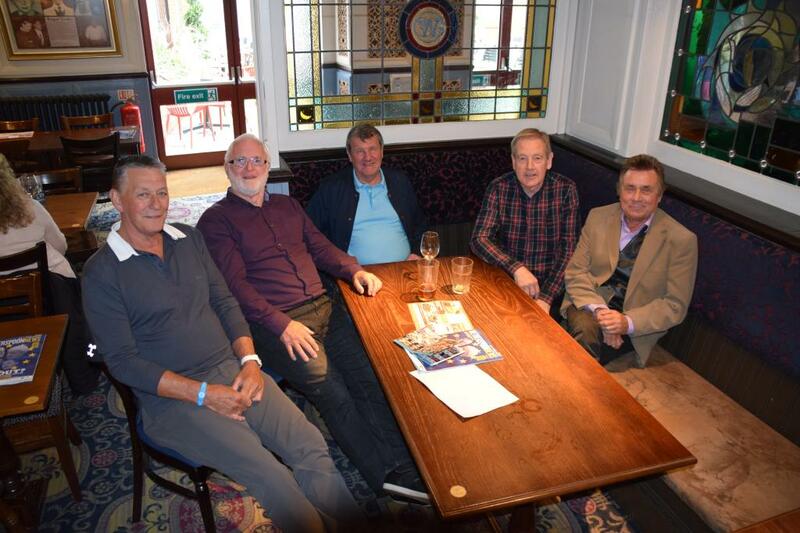 Sadly several of us had previous engagements, but not to miss out on an opportunity emails were sent, addresses researched and phone numbers obtained which resulted in a group of old school friends meeting up (post party) who for some hadn’t seen each other for over 53 years. The mini re-union took place on the 25th May in Watford at the Moon under Water, where (from L – R) Ian McKinnon, Dave Lawrie, Pete French, Ken Laver, John Johnson and me Mike Simpson (behind the camera) met for 3 hours of reminiscences and humorous anecdotes, resulting in much laughter bordering on the rowdy as the odd bevvy assisted us with our recall. Some things don’t change!! The get together after so many years was much enjoyed by all as we recalled our School sports prowess in particular, the 60’s music scene and the Clarendon School Band in which Pete and Ian played. Ah……memories are made of this! Hi….my name is Wendy Cox…formally Wendy Cooke. I attended Clarendon school from 1952-1957. Mrs Cook domestic science.Mr Lord art. I have a couple of pics from this time.It was a great school….great education. I became a professional artist on leaving school. I now live in Australia….much warmer here. I sincerely hope that all these lads depicted above will be able to make it to the informal launch of David Reidy’s forthcoming book on the History of Clarendon School 1951-67, to be held later this year in South Oxhey. Details will follow in the next while. All good wishes, John Swain (72 not out).